I found the Seafly Memories site during a moment of nostalgia and noticed that there was no info about my much loved Seafly. I bought Seafly 95 in 1987 in complete and serviceable condition but in need of serious TLC. I raced her at Worthing Sailing club for several years including the 1989 Nationals. I won the club points series with her in 1990. 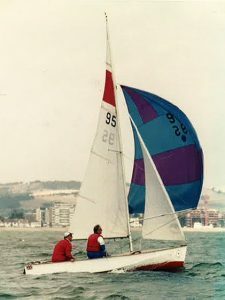 I retired her from racing in about 1992 and moved her to Dell Quay in Chichester harbour where she was regularly day sailed and cruised until I sold her to another DQ club member in 2004. Last seen afloat in the harbour in 2005. No further info.